Are you securing IT assets in a public or hybrid cloud? Concerned about increasing cybersecurity threats? If you are, you’ve found the right course! Gain insights into Microsoft learnings from responding to customer cybersecurity incidents and from helping customers defend their cloud assets and manage the shared security responsibility for cloud services. Mark Simos, an architect for Microsoft Cybersecurity, and Tim Rains, chief security advisor at Microsoft, have created a new Microsoft Virtual Academy (MVA) course, Security in a Cloud-Enabled World. 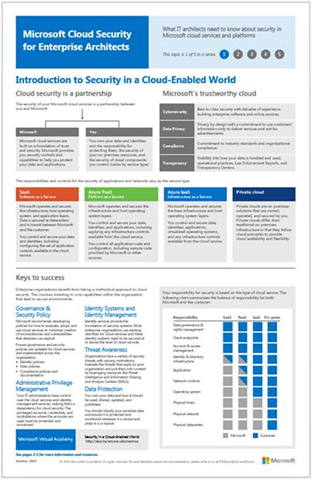 This new course is based on material developed for the Microsoft Cloud Security for Enterprise Architects poster. You can download the multi-page poster as a PDF or Visio file or view it in a new easy-to-browse format. Check out the entire set of Microsoft Cloud IT Architecture posters here.